By Chris Williams: Right now a fight next year between Floyd Mayweather Jr. and WBO welterweight champion Manny Pacquiao is up in the air. Pacquiao’s promoter Bob Arum is supposedly in negotiations with the help of outside investors, but Mayweather himself still says there are no negotiations taking place and sees it as a bunch of a hot air coming from Arum. Freddie Roach, Pacquiao’s trainer, has no clue if negotiations are happening between the two sides but he’s already dreaming up ways for his fighter Pacquiao to beat Mayweather. What the bad habits are Roach doesn’t elaborate on. The only thing I can see is Mayweather’s low workrate. He spends so much time just looking to counter that he’s not always throwing a lot of punches. Roach might have Pacquiao try to outwork Mayweather and overwhelm him with shots the same way Pacquiao did against Joshua Clottey last year. Pacquiao stood directly in front of Clottey all night long and threw over 1000 punches in a 12 round bout. 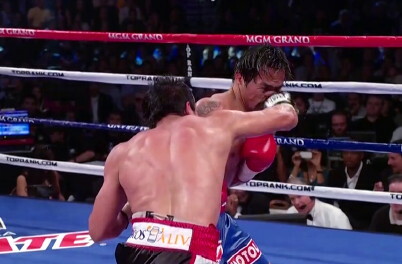 It looked as if Pacquiao wasn’t even loading up much of the time and was just looking to try and connect to score points. If Pacquiao tries to overwhelm Mayweather, he’s going to get hit with a lot of clean shots that he’ll likely not see coming, and we could see Pacquiao knocked down or taken out with one of Mayweather’s short check left hooks or right hands. Roach needs to be more concerned with Pacquiao’s flaws than Mayweather’s. Pacquiao has lost his legs and is now a fighter that only plods. He’s a lot less effective now than he was two years ago, and he’s coming off of what many boxing fans see as a gift decision over Juan Manuel Marquez.